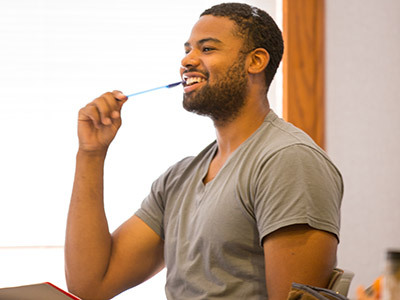 Admissions essays are required for some of the Seminary's certificate and degree programs. Details are included below. Need further assistance? Let us know at admissions@pts.edu. Applicants for all master’s degrees (MDiv, MA, MATM, MATS, ThM) must submit both of the following essays. Be sure to include your full name in your essays. Please compose the documents in your own word processor, double-spaced with 12 point font. You may then either e-mail your essay to admissions@pts.edu or upload a document through the form submission tool available on the "Checking my Application" tab of my.pts.edu. As part of your application, you will need to submit a personal statement (of approximately 300 words) describing who you are and your gifts for ministry. Place particular emphasis on your vocational plans and reasons for applying to Pittsburgh Theological Seminary. Please note that neither a resumé, nor a resumé narrative, meets this requirement. You will also need to submit an analytical essay of 750-1000 words. This essay will be evaluated on how well it follows the guidelines and addresses the topic, grammar and structure, and capacity for theological reading and writing. Topic: Identify one author or text that has been influential in your understanding of your calling/vocation. Identify passages and theological or religious themes that have been particularly formative, and explain how they have influenced your own sense of call. Please note: Proper citation (i.e. footnotes or endnotes) is indispensable for this exercise. Applicants to the Church Planting and Revitalization Certificate program must submit both of the following essays. As part of your application, you will need to submit a personal statement (of approximately 300 words) that describes your current ministry context and your sense of call to church planting and/or revitalization. Be sure to describe both the setting in which you serve (or will serve) and what you hope to learn during the certificate program. Please note that neither a resumé, nor a resumé narrative, meets this requirement. Applicants for the Graduate Certificate in Urban Ministry program must submit both of the following essays.